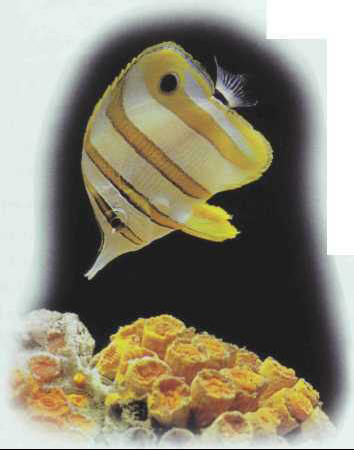 The elongation of the "beak" of the copperband butterfly fish (more pronounced than that of the Chaetodon genus) has evolved to enable it to pick out food from crevices in the coral. This robust species swims slowly, except when it is alarmed. It feeds on small, live prey, notably crustaceans. Size: 17 cm. ХАНГАЙ , нагорье в центральной части Монголии. Длина ок. 700 км. Высота 2-3 тыс. м (наибольшая - 3905 м, г. Отхон-Тэнгри). Вершины преимущественно плоские. Сухие степи, на северных склонах - таежные леса.